What Does Cinema Mean for Paraguay? This article was originally published in the Paraguayan newspaper, Diario Noticias, on December 23 1995, as part of a series of articles dedicated to the 100 Years of Cinema celebrations. As the 20th century draws to a close, the first century of motion pictures, it is unthinkable that there could be countries without their own national cinemas. Just as individuals benefit from portraits or images of themselves, societies also need to have their own images projected on the screen in order to reflect on questions of identity, history and destiny; and to affirm the unique characteristics of their language, the way they are, how they express themselves and see the world. Nevertheless, for a country like ours, which is backward on all fronts, the cinema is barely given the attention of a distant spectator. Paraguay was a glaring absence in the retrospectives that marked celebrations of the first century of cinema throughout the world. It is a nation without moving images, an invisible country in an age of civilization distinguished by mass audio-visual imagery, narrative and storytelling. Throughout the 20th century, film in Paraguay has struggled. This has occurred for various reasons: we have lacked a cinematographic tradition of national styles and genres; there have been sporadic co-productions on location in Paraguay with national talents (mainly writers, actors and art directors) where only a few of these have been 100% Paraguayan productions; film production and cine-clubs were persecuted by the totalitarian government during the ’70s and ’80s because they were considered to be “subversive activities”; the private Cinémathèque was established at the beginning of the “democratic era” – 1990 – without state funding and only with a minimal municipal subsidy (as a matter of fact, the Paraguayan Cinémathèque and Visual Archive foundation, Fundación Cinemateca and Archivo Visual del Paraguay, is the only organization dedicated to the preservation and promotion of film culture in Paraguay); and finally, there has never been implemented legislation for the promotion, production, exhibition, distribution, and discussion of film. Countries with fewer economic resources (Bolivia and Ecuador just to cite two examples) have film activities, which, although perhaps not traditional, boast an extensive national filmography, ranging from silent film to the present day. Add to this scenario the irony that the only completely Paraguayan large-scale production financed by the State – the historical full-length feature film, Cerro Corá (Paraguay, 1977, Guillermo Vera) – was made not for cinematographic ends but as political propaganda and to extend the fascist version of history promoted by Stroessner´s dictatorship. Hence, Cerro Corá was never considered to be of any international, commercial, artistic or cultural significance. Paraguay, however, enjoys the ideal conditions to produce cinematic narratives, including a myriad of topics and storylines; virgin landscapes, an outstanding climate and superb light; talented and trained professionals, whose skills can only improve with practice; cheap labor; etc… Quite simply, we have not managed to awaken public and private sector interest in the importance of and investment in producing and projecting our images to the rest of the world. I understand that in other places image and sound is treated as secondary because it can appear to be excessively expensive, because cultural identity is not treated as something of paramount importance when in fact it is. The image is not as superficial as it appears, since it transmits a whole world, from the consumer object to thought. All societies have their painters and sculptors; likewise, they must have their filmmakers who are able to tell their own stories… There is a huge need for the exchange of cultures in the world, and if a people have nothing to exchange, this lack brings with it an enormous loneliness, a darkness, a communicative one-way street. I believe that in the twenty-first century a people who are unable to recognize themselves in the fictions that are offered them are heading down a road of utter frustration and run the risk of disappearing. The USA is the only country today which makes national films that are successful on an international level: their culture has become world culture. For many years now, European countries have been coming together for cinematographic production, strengthened today by the treatment of the audio-visual as an exceptional cultural product. The only possibility for Paraguay, as other small countries like ours, is international co-production, especially in collaboration with neighboring countries and the members of Mercosur (the Common South Market, which includes Argentina, Brazil, Paraguay, Uruguay and Chile). Our country’s efforts should be directed towards defending our own creative and authorial capacity so that Paraguay ceases to be an unknown quantity to itself and an absence on the world stage. This hope is proportional to the huge national debt and challenge to boost the development of Paraguayan culture that lies before us. This year began with the sad news of the closure of the theatre, Cosmos, almost as legendary for cinemagoers as the theatres Roma and Granados (which have been converted into evangelical temples), but the year draws to a close with an extremely positive balance on the scales: four new screens, those at the shopping centre Excelsior and those at the shopping centre Sol, as well as the considerable improvements at the cinemas Premier and Yguazú. We can now feel proud of having first class cinemas with Dolby Digital Stereo, excellent projectors and a new level of comfort, which will no doubt influence the viewing habits of a public that are already on the rise. This situation, combined with the number of new releases that were showcased this year in our city Asuncion allow us to forget the terrible decade of the ’80s when cinematic exhibition in Paraguay fell to an all-time low. We have made a leap in the technical quality of cinematic exhibition, in the immediacy of international new releases and in the range of films that can be seen in our capital city. It goes without saying, however, that this diversity of films screened does not include the commercial cinemas, where new releases from the USA account for 98% of all films shown. It is the Paraguayan Cinémathèque Foundation (Fundación Cinemateca del Paraguay), fuelled by a highly motivated cultural effort, and basically funded by private companies and diplomatic missions, that has offered seasons of alternative cinema, festivals and the Asuncion International Film Festival, held annually since 1990. There is no doubt that we are moving towards a peak in terms of alternative opportunities of cinema exhibition on par with the worldwide resurgence of the cinema as a popular entertainment form and the most sophisticated art of our times. And the announcements for 1996, both on exhibition as well as in national production, lead us to think and hope that we are witnessing the beginnings of a new era of film in Paraguay. Both film production and exhibition in Paraguay have improved in some ways. Furthermore, national consciousness and appreciation of motion pictures has also grown significantly over the last four years. 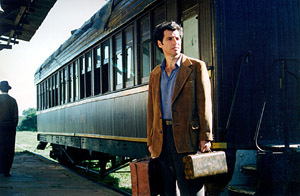 Three Paraguayan feature films, in particular, have achieved significant presence in international film festivals and have been responsible for the Paraguayan people’s growing interest in seeing their own stories projected on the screen: the large scale co-production The Call of the Oboe (Paraguay-Brazil, 1998, Claudio MacDowell), a fiction film entirely filmed in Paraguay; The Gate of Dreams (Paraguay, 1998, Hugo Gamarra), a documentary-fiction about the most important Paraguayan writer, Augusto Roa Bastos; and María Escobar (Paraguay, 2001, Galia Giménez), a fiction based on a popular Paraguayan song. Moreover, there are two other features currently in post-production. Digital technology and the presence of new, young talent suggest a promising future for Paraguayan film production. In terms of exhibition, there are now 20 theatres operating in shopping centres and four in other cities of Paraguay. The types of films they show has improved somewhat; though 90% of films released belong to American major distribution companies, the remaining 10%, which are mainly European or independent American films, come from small independent distributors in Argentina (the territory of Paraguay is included in the exhibition rights of Argentina). Despite a hiatus in 1999 and 2000, the Asuncion International Film Festival with its eclectic program has boosted interest in films other then the mainstream American variety. The 2001 edition of the Festival was a huge success with films from Latin America, Europe and Iran. Unfortunately, this surge of film activity in Paraguay largely depends on “the free market” since there is no support or input from the State or other cultural institutions. The Cinémathèque is at a standstill; its future depends on the new municipal administration to re-allocate funding that has been taken away from it. The economic crisis and the ongoing political struggle for power since the assassination of the Vice President and resignation of the President in 1999 has not allowed for sustained improvements in the area of culture or even education. However, the creation of the Paraguayan Chamber of Audio-visual Production Companies, the National Fund for Culture (FONDEC) and the opening of university programs and degrees in audio-visual studies reinforces the possibility that in the near future there will be a National Audio-visual Institute and mechanisms to aid the production and promotion of Paraguayan films. The answer to the question, “What does cinema mean for Paraguay”, remains at best open. Hugo Gamarra Etcheverry, aged 46, is a filmmaker, Director of the Asuncion International Film Festival and President of the Paraguayan Cinémathèque.